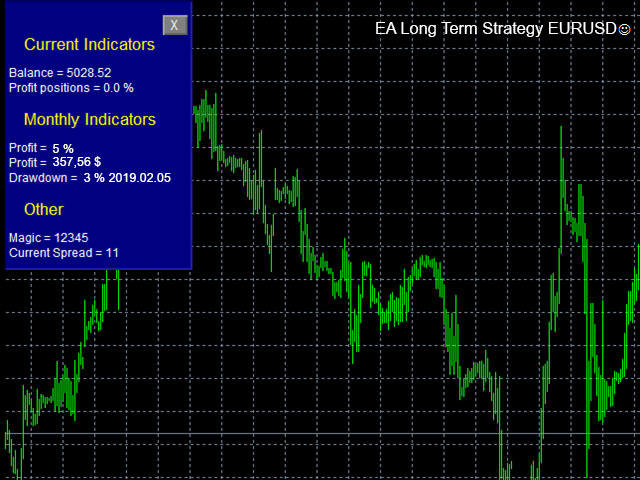 Trading strategy in the advisor Long Term Strategy - adjusted individually for a pair of EUR/USD, taking into special characteristics EURUSD. The strategy of the advisor is based on identifying overbought and oversold zones using the indicators CCI and RSI. Transactions are opened only by the trend. The recommended timeframe is M15. Additional option set files for EURUSD. Also please attach your successful sets in the discussion, it will help other users. Advisor does not use martingale, grid, averaging. It is easy to check on the indicators of the volume of transactions, they do not have sharp jumps. Minimum deposit of $ 100, with ALDB -1. If the global trend changes and the position is present, the advisor closes the trades without waiting for the full number of stop loss points to be received. The EA has several entry points, which helps to determine the most accurate entry zones. Upon receipt of a profit, the advisor may partially close the transaction or go to breakeven. The Expert Advisor was successfully tested from 2004–2019 on Ducascopy tick data with a floating spread. Prefix- if your broker has a prefix before the word EURUSD (for example m.EURUSD, Prefix=m. ), write it in this box. If not, leave the empty column. Suffix- if your broker has a suffix after the word EURUSD (for example EURUSD.mn, Suffix=mn. ), write it in this box. If not, leave the empty column. TimeFrame - timeframe selection, if stay = current is set, the period of the chart on which the adviser will be installed will be used. It is recommended to use TF- m15. TakeProfit_Pips - take profit in pips. StopLoss_Pips - stop loss in pips. Breakeven - the number of profit points when moving a position to breakeven. Breakeven_Level - the level after which will be achieved by modifying the position to breakeven. Stop_if_changd_trend - drawdown in points for closing Buy and Sell orders when the signal changes. Allow_Sell_Position - allow opening sell positions. Allow_Buy_Position - allow opening buy positions. Use_vizual_SL - the ability to enable / disable virtual stop loss. FixedLot - trade only with a fixed lot, to disable - set 0. Rec_Deposit - true / false - increase the lot of the subsequent transaction when receiving s / l.
Moving Average - indicator period value. Commodity Channel Index - the value of the indicator period. Relative Strength Index - the value of the indicator period. Average True Range - value of the indicator period. Filter_CL_Pips - filter for closing positions. MagicNumber - is the magic number of the order. MaxSpread - maximum spread for opening orders. If this indicator is exceeded, a new order will not be opened. If the spread of your broker is more than 30 points for 5 digit broker (I set up 30 by default set) , change this value because orders will not open. Open_Slip - allowable slippage when opening. Close_Slip - allowable slippage when closing. Requote_Control - allowed number of requotes. PanelShow - open / hide information about balance changes. Good EA. Catches the trend retrace nicely. Less number of trades but hopeful that it builds the account steadily in the long term! Bagus sekali...EA dapat mengikuti Trend dengan baik. Хороший бот. Поставил себе в портфель среднерисковых после прогона. Должен удвоить депо через 4 месяца. Робот не имеет опасных стратегий, при консервативных настройках свои 100% в Год берет при минимальных посадках. Также можно использовать его для разгона более агрессивно. Универсальный робот - очень доволен! Молодцом, автор знает, что делает. Отличный советник! Автору респект! Всем рекомендую! С понедельника ставлю на реал, похоже я нашёл, что искал. Спасибо за труд. Added an info panel with indicators of current and monthly yield, readings of the current spread and magic numbers of the set of files are displayed. Fixed typos in the description. The code of the advisor has been improved, filters for opening and closing positions have been added, settings for money management have been added.